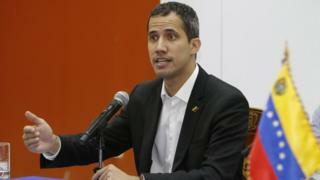 Venezuela's self-proclaimed interim president Juan Guaidó says he is on his way back to Venezuela despite the risk of being arrested upon arrival. In a recording posted on his Twitter account, he said: "Venezuelan brothers and sisters, the moment you hear this message I will be on my way back home." He also called on Venezuelans to join anti-government protests planned for Monday and Tuesday. Why is Mr Guaidó's return risky? After Mr Guaidó proclaimed himself interim president on 23 January, Venezuela's Supreme Court - which is dominated by loyalists of President Maduro - placed a travel ban on the opposition leader. Mr Guaidó defied that to attend a fund-raising concert in Colombia on 22 February organised by billionaire Richard Branson. Mr Guaidó also led efforts to try to bring humanitarian aid, mainly donated by the US, into Venezuela. The government of Mr Maduro rejected the aid, arguing it was part of a US plot to overthrow him. The president ordered the closure of borders with Colombia and Brazil. 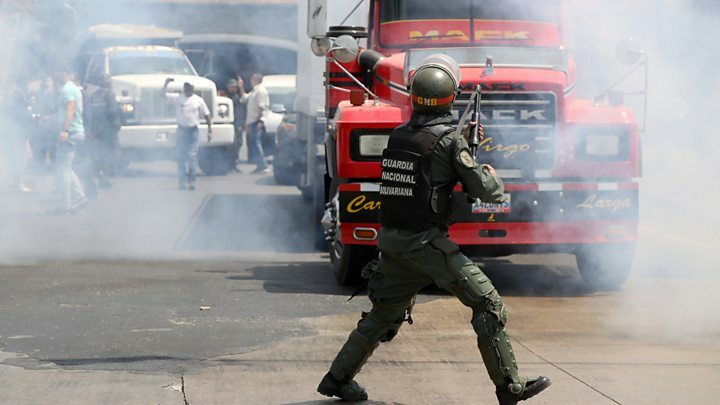 Soldiers blocked the aid trucks, leading to clashes that left at least five dead. The Maduro government alleged - without giving any evidence - that the aid was contaminated and carcinogenic. It is not clear. He had left by secretly sneaking across the Venezuela-Colombia border, reportedly with the help of sympathetic Venezuelan soldiers. Mr Guaidó could sneak back over the porous 2,200km (1,370 mile) border on one of the many paths used by smugglers. He could also go via Brazil or Guyana, which also share borders, mostly in deep jungle. In all three cases, he would face a long journey to Caracas. The other option, and the most confrontational one, would be to fly directly into Caracas. There are direct commercial flights from Bogotá and Panama City. How likely is his arrest? Flouting the travel ban imposed by Venezuela's highest court is likely to get Mr Guaidó into trouble. President Maduro has hinted at such. "He can't come and go, the justice system had banned him from leaving the country. I respect the laws," he told ABC last week. Communications Minister Jorge Rodríguez said that arrest was "irregular" and the agents involved were dismissed. Mr Guaidó appears willing to face the risk of arrest, saying: "If the regime dares, of course, to kidnap us, it will be the last mistake they make." He also tweeted [in Spanish] that he had left instructions for his international allies for "a clear route to follow" should he be detained. What would be the likely reaction to his arrest? US National Security Adviser John Bolton wrote of a "strong and significant response" on Twitter. EU foreign policy chief Federica Mogherini said that any measure that would put at risk Mr Guaido's "freedom, safety or personal integrity would represent a major escalation of tensions". Diplomats from the Lima group, a bloc of 14 Western Hemisphere countries created to tackle the Venezuela crisis, said last week that "serious and credible threats" had been made against the life of Mr Guaidó. How secure is President Maduro? However, there are unconfirmed reports that Diosdado Cabello, the National Constituent Assembly head, sent his two children to Hong Kong, which the opposition thinks is a sign of growing nervousness.